This sweet and spicy vegetarian sandwich is packed full of vibrant colors and exotic flavors. 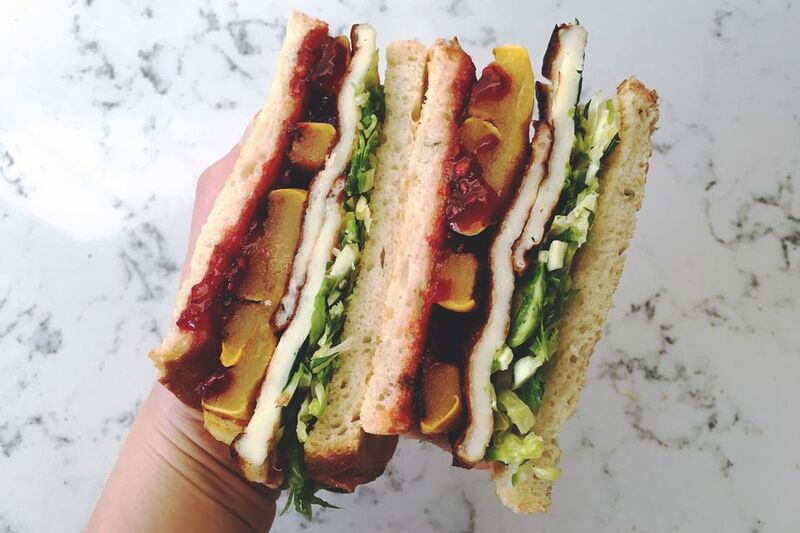 Seared salty halloumi cheese is stacked high with sweet roasted Delicata squash, lemony brussels sprouts slaw, and a sweet and spicy raspberry Harissa jam with tart greek yogurt. It's every vegetarians dream but it also holds up to even the highest of meat-eaters expectations. Toss delicata squash rings in olive oil, cinnamon, salt, honey, and cayenne pepper. Arrange evenly on a baking sheet and bake for 30 minutes or until tender and beginning to caramelize. Mix raspberry jam and harissa paste and set aside to meld. Place shredded sprouts in a large bowl. In a smaller bowl, whisk together olive oil, sherry, honey, mustard, lemon, salt and garlic powder until combined. Add the wet mixture to the sprouts and stir to coat. Set aside. Toast your bread. Smear one side with greek yogurt and top with brussels sprouts slaw, the seared halloumi cheese and the roasted squash. Smear the raspberry harissa jam onto the remaining piece of bread and place it on top. Serve immediately.